Also Pattinathar and Karuvoor Thevar Sung Psalms about the Deity. This place is named as Idaimarudur as it is in between Srisailam and Ambasamudram. It is also called Shanbagaranya, Saktipura, Tapovana, Muktipura etc. The presiding Deity is Mahalinga (Great Linga) because Siva worshipped Himself. Her consort is Perunalamamulaiammai. She is Bruhatsundara Gujamabika. In her Shrine is a cell facing north. This is the temple of Mookaambika (in North Indian style). The Goddess is in the pose of doing penance. She is mentioned as Pidari Parameeswari in inscripitions. There are many Lingas in the Shrine. Agasthiya Linga, Kasyapa Linga, Chola Linga , Chera Linga, Sahasara Linga, Panchabhuta Linga, a cluster of 27 Lingas behind Chokkanatha are some. Brahmahathi (Hathi- sin caused by a murder – Brahminicide) is found in the south wall (south torana vayil) with head disheveled and face immersed betwixt the knees. Varaguna Pandiya’s horse accidentally crushed a Brahmin and killed him. The sin followed wherever he went. The king came to this temple. The Brahmahathi could not enter and waited outside. The king went out by another entrance. The Brahmahathi is waiting outside still. The king was relieved of his melody. People inflicted with mental disorders go round the circumambulatory path and get redress. Sthala purana written by Sivakkolundu Deshika of Kottaiyar Marudavana Puranam. There is an Ula written by Mahavidvan Meenakshi Sundaram Pillai. 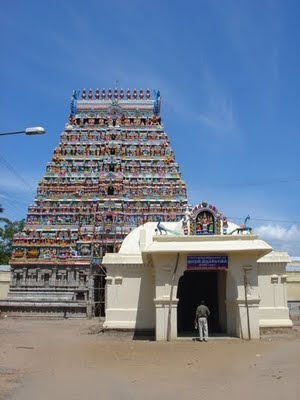 The Thevaram, Thiruvasagam, Thiruvidaimarudur Mummanikkovai, Thiruppazh, Thiruvidaimaurudur Pathirruppathanthathi, Thiruvidaimaurudur Kalambakam, Thiruvidaimarudur Nondi Natakam contain sufficient information about the temple. Kandapuranam, Lingapurana, Brahmavaivartham and Sivarahasya mention the glory of the Lord. This temple is maintained by Thiruvavadudurai Adheenam. His Holiness Seervalarseer Sivaprakasha Deshika Swamigal (23rd Gurumagasannidhanam), adorns the throne of the Adheena and doing all kinds of spiritual (Sivatthondu and Tamilthondu) and social service. Thiruvidaimarudur is located around 8 k.m north of Kumbakonam city on the road to Mayiladuthurai. All the buses pass via this route with a stop closer to the temple at Thiruvidaimarudur. The distance from Mayiladuthurai (Mayuram) is around 32 km. Autos / Taxies from Kumbakonam are available. There is a small Railway station at Thiruvidaimarudur. Only the passenger trains stop there. The nearest convenient railway station is located at Kumbakonam with connectivity to Chennai (via Trichy), Thirunelveli (via Dindugal, Madurai), Coimbatore (Satapthi), Mysore(Via Erode - Salem - Bangalore).